A fractured region near Cairo Sulcus on Enceladus. Credit: NASA/JPL Space Science Institute. New images from the Cassini orbiter reveal structures on Enceladus that seem to have an electrical origin. 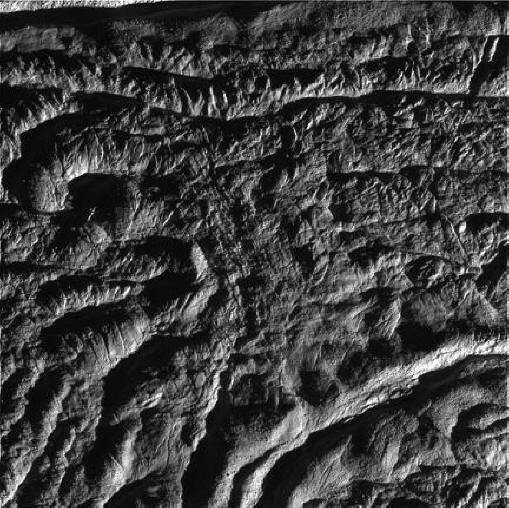 The Cassini mission team says the picture “shows the myriad of faults, fractures, folds, troughs and craters that make this Saturnian satellite especially intriguing to planetary scientists.” The detailed portion, shown above, of the so-called "broad belt of complex, interwoven fractures" reveals them to be deep, steep-walled chasms with loops in their twining pattern. Planetary scientists immediately identified these features as “fractures.” They do look superficially similar to tectonic faults and areas of crustal compression on Earth. Although Earth is more geologically diverse than any other body in the solar system, projecting earth-based doctrines onto alien landscapes starts to lose coherence when confronted with surface features like those on Enceladus. Traditional geology has excluded electric discharge as the most direct and complete explanation for the scarring patterns observed globally on Enceladus, so the eons-long processes that are theorized to have created what they see on Earth are said to do the same things there. However, these features on a tiny rock with no atmosphere were never anticipated by theory. Cassini recently flew close by the superheated geysers erupting from the south polar region of this frozen moon. One of the focal points of its trajectory was the "tiger stripe" sources of hot vapor erupting into space and contributing to Saturn's rings. Because of several anomalous aspects to the plumes of gas jetting out of the tiger stripes, those who favor the Electric Universe hypothesis have always advocated a systematic comparison of textbook geology with electric discharge theories. Electric arcs excavate surfaces in ways that cannot be duplicated by slow geologic process. Grooves and trenches left by arcs will typically reveal little or no residual material within the trenches, as if a claw simply descended from above to scoop material away. Arcs can produce entwining rope-like trenches where undulating discharge filaments move across the globe. Gouges are cut lateral to the surface without the crustal movement required by fracturing. No lateral displacement (which will show up most obviously where one trench angles across another) can be observed on the surface of Enceladus. It bears repeating that the hot poles of Enceladus were a surprise to NASA investigators. "This is as astonishing as if we'd flown past Earth and found that Antarctica was warmer than the Sahara," said John Spencer, an astronomer from the Southwest Research Institute in Colorado. A NASA news release announced, “The rare occurrence of liquid water so near the surface raises many new questions about this mysterious moon." Scientists jumped to the conclusion that liquid water beneath the surface must be responsible for both the temperature anomaly and the jets because solar heating and internal heating are the only energy sources that are allowed in their theories. Solar heating is completely inadequate because the moon is so far away from the Sun. Although the south pole of Enceladus is warmer than "it should be" it is still 261 degrees below zero Celsius. So-called "tidal kneading" from Saturn fails because the theory has no explanation for why the effect is limited to the southern hemisphere. Electric Universe theorist Wal Thornhill has suggested that the hot jets move across the surface because they are being created by electric discharges. The electric arcs that produce the jets are creating the observed channels as they excavate material from the surface and accelerate it into space. A parallel to the Enceladus plumes is provided by the “volcanoes” on Jupiter’s moon Io. The bright plumes on Io have moved many kilometers across the surface during observation over a few decades, excavating material and accelerating it upward in jets that precisely match the predictions of a “plasma gun” model. 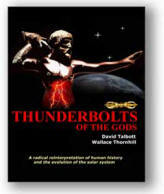 Visitors to the Thunderbolts.info site have have often wondered whether they could fully appreciate the Electric Universe without further formal education. The answer is given by this exquisitely designed book. Readers from virtually all backgrounds and education levels will find it easy to comprehend, from start to finish.